Do you remember the iconic episode of Father Ted when the Craggy Island parochial house gets infested with rabbits? Well, Ted hoped that Tom would take care of them - in more of a Julie Andrews way, not Al Pacino - but another idea revolved around the idea of racing rabbits at the greyhound track that's owned by Paddy Jordan. Dougal might have had ten pounds riding on Eamon, but in Mr Jordan's words "call me old fashioned but I prefer the more conventional greyhounds pursuing rabbits approach". Well, two furry intruders managed to make their way onto the track at Dundalk Stadium in Ireland this evening and they were very much in love. Awww! 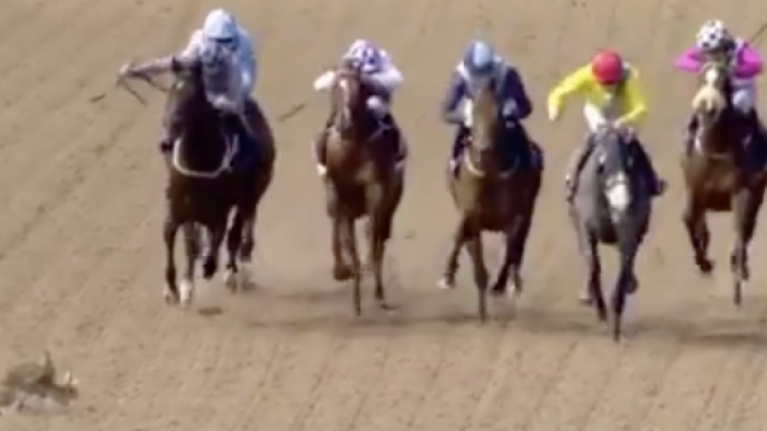 As you can see below, the 18.45 race took an interesting turn when the horses nearly trampled two rabbits/hares that were very much in the act. A horse named Sky Seven won the race after a fine ride by Ronan Whelan. However, that really wasn't what many viewers noticed.